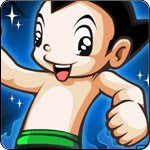 In this game, Astroboy have to survive from various traps to find the export. There are detailed tutorial demonstrates of dodge skills that you can use.This game has 40 levels totally. If you can not pass a level, you can skip it.Would you like to help Astroboy avoid dangers? You will love it. Come on! Try this game!